Standing on the edge of Mariscal Canyon at sunset, the skies colored with pastels of pink and blue, I found myself in the middle of one of my more memorable trips to the Big Bend area. But sometimes the journey is just as important. And the effort to reach the Canyon rim of this grand and rugged landscape made the view that much more satisfying. Rewind about 24 hours… we had arrived at the Chisos Lodge with a full agenda of locations to photograph at both sunrise and sunset. My wife joined me on this 3 getaway and had agreed to some more, ahem, adventurous hikes if we had a room (as opposed to a tent or back of my 4-Runner). So when an opening at the Chisos Lodge came up, I booked it and plans were made. We were supposed to arrive in the early afternoon on a Friday after a seven hour drive from our home in the hill country. We arrived later than expected, thanks in part to a mysterious illness that had sapped my strength. Our plans to ascend Emory Peak, the highest point in the National Park, were laid to rest, and I could barely make it around the Window View loop… truly disheartening. Determined not to let this trip be a failure, I rolled us out of bed the next morning and we drove an hour to Santa Elena Canyon. I’ve shot here several times, but I thought by climbing the few hundred feet of easy switchbacks to shoot sunrise as daylight lit up the Rio Grande valley, it might be a little test for my legs to see how I’d feel for something much more taxing. I should note here that I work out most days and longer hikes of 10+ miles are something I really enjoy. I made it a half mile and felt about 60% normal, so I was willing to attempt the next part of our plan – and the real reason we drove this far. Several years prior to this excursion. I’d read trip reports about Mariscal Canyon, a remote rock Canyon 1200 feet above the river. Since then, this had been one of my goals. But timing was important. In the spring, the trail is closed because of peregrine falcon nesting. In the summer months, the temperatures are too hot, staying over 100 degrees most of the day. So here we were, ready to take on this next adventure in early November. The hike itself is not that difficult on paper, requiring a 1200 feet ascent over 3.5 miles. However, the trail is faint, and in many places marked only by cairns every 20-50 yards. 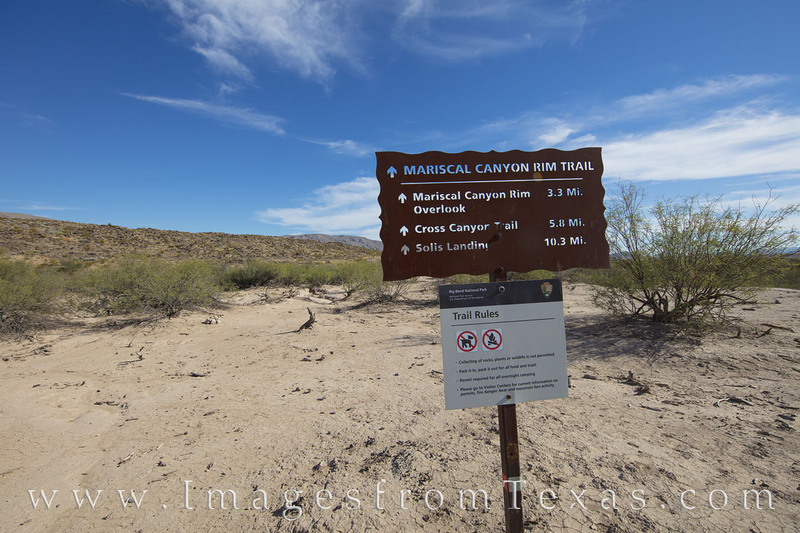 The first 2 miles you gain virtually no vertical feet as the trail crosses several washes, taking you up and down, though mesquite trees, scrub and cacti, and across large areas of nothing. And then you start climbing. But I am getting ahead of myself. After shooting what turned out to be a rather amazing sunrise at Santa Elena Canyon, we took Old Maverick Road to Terlingua and Far Flung Adventures. From this local establishment, we rented the only available Jeep in town. From all my research, this is literally the only Jeep one could rent – anytime -for at least 100 miles. Kudos to the staff who were friendly and helpful, but I had to laugh when Austin, one of the workers and an experienced hiker, warned that even he would not hike our intended trail at night… just too steep and too much loose rock to be safe. My wife was not pleased. The Jeep and 4-wheel drive would be necessary for where we were going. My 4-Runner could potentially make it, but I also want my 4-Runner to last several more years. We drove the Jeep back to the Chisos Lodge for an early lunch, bought some gifts for our young daughters, then departed for River Road East around 1:45pm. Turning onto the dirt road after 30 minutes of smooth driving, we began a brutal 90 minute grating and grinding crawl along what I’d call one of the longest sustained %$*#iest roads I’ve ever driven. My wife, who had been been rear ended by stupid/careless drivers several years prior and is sensitive to jerky movements now, held her neck as best she could to mitigate the jarring. I don’t think it helped. My hands hurt from gripping the steering wheel; my back hurt from the constant jarring. And after 30 long miles along River Road East, Black Gap Road, and Talley Road, we arrived at the trailhead. After 30 miles of a horrid dirt trail on the south side of the Chisos Mountains in Big Bend National park, our jeep finally brought us to the end of the road – literally. We exited the car to find this trailhead sign awaiting us – and our destination was Mariscal Canyon and the rim that overlooked the deep Rio Grande Valley below. Opening the Jeep door, we were met with unusually high temps for November – 95 degrees and no shade in sight. I soaked my hat in cold water, started tracking with 2 GPS units, loaded the backpacks with a camera, two lenses, tripod, flashlights, lots of water and Gatorade, and we were off. The trail starts off by following cairns through a wash of mesquite, then rises 300 yards later on the other side. The first two miles is uneventful, taking you through barren landscape where only tarantulas seemed to live. After one mile and baking in the full force of the sun, we were able to take refuge in the small shadow of a tall yucca. It wasn’t much, but that shade made a huge difference as we guzzled water for a few minutes. We stopped to drink whenever shade presented itself, which wasn’t much. 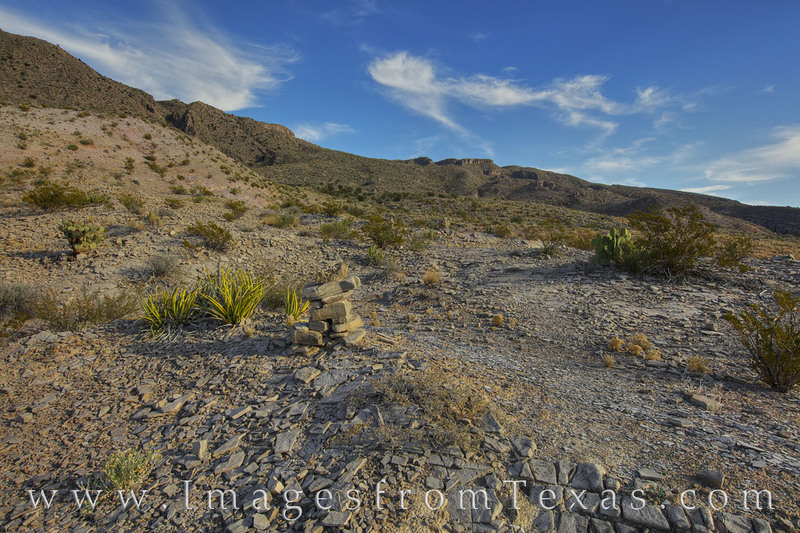 Though the trail was lacking, these cairns (lower middle of the image) mark the way leading up to the remote and amazing beautiful Mariscal Canyon in Big Bend National Park. While easy enough to spot during the day, returning in the dark proved more tedious – and a visual challenge. Strong flashlights helped, as did patience. On the way up, we encountered big horn sheep; on the way down a family of javelinas. The reward was one of the most beautiful locations anywhere in Texas. After two miles, we started the ascent, and the cairns led us up to a flat area about 800 feet above the Rio Grande. Looking back from where we came, we could see the winding green swath the river cut through the dry and scorched Chuhuahuan Desert. The path from the Mariscal Canyon Rim Trailhead up to the canyon rim really isn’t much of a trail, but a series of rock piles (cairns) that lead across a few miles of the Chihuahuan Desert and up a scrub and cacti-filled slope. Eventually, after trekking over lose rocks and 1200 vertical feet, you’ll reach the amazing vistas the canyon rim offers. 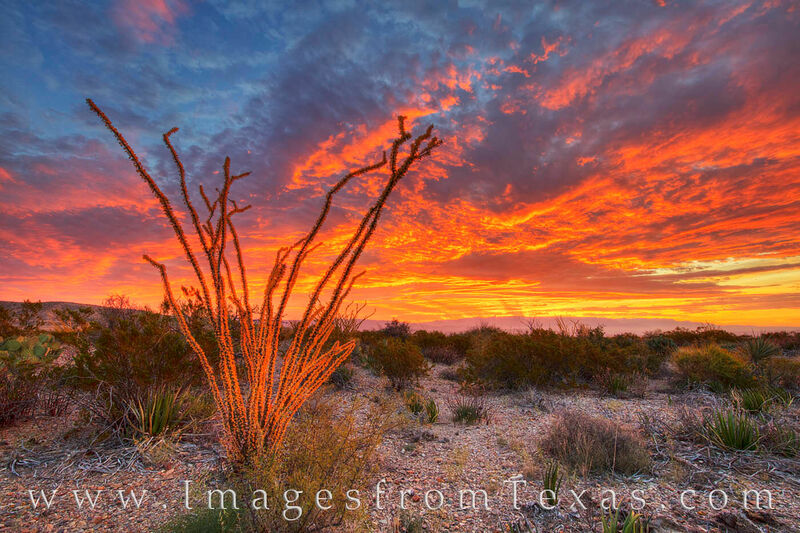 As one of Big Bend’s most remote areas, you’ll rarely encounter others, and you’ll have the desert to yourself. This view comes from about the 3 mile mark. As you make your way towards the canyon rim, turn and round and enjoy the beautiful Rio Grande River valley with the ancient mountains of Mexico in the distance. 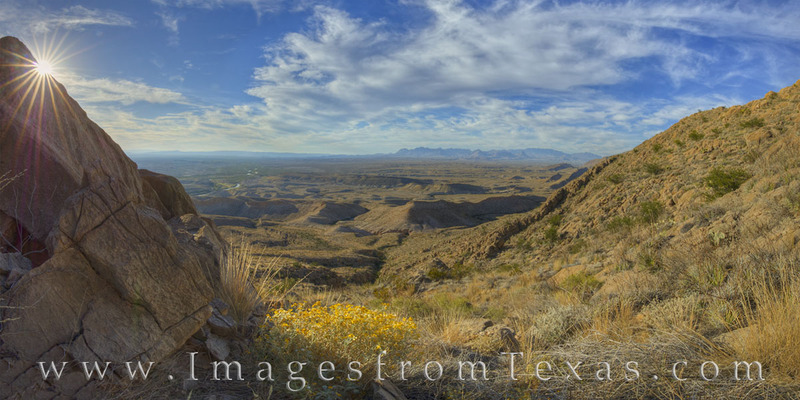 This Big Bend panorama is available in larger and custom sizes. My wife was suffering at this point, and I was worried she was overheating. We paused in the shade of a large rock outcropping, rehydrated, and rested. As for me, I felt fortunate to be in a place like this, and I was getting stronger by the hour, feeling more and more in my comfort zone. Five minutes later we continued upward, covering the final 500 vertical feet over about a third of a mile. The rocks were loose and the trail wandered higher through cacti and sharp rocks. Finally, after plodding for 30 more minutes, we arrived on the plain of the plateau and worked our way to the Canyon rim. Exploring the edge of the abyss, I settled on what was my favorite view of the Canyon walls and Rio Grande far below. 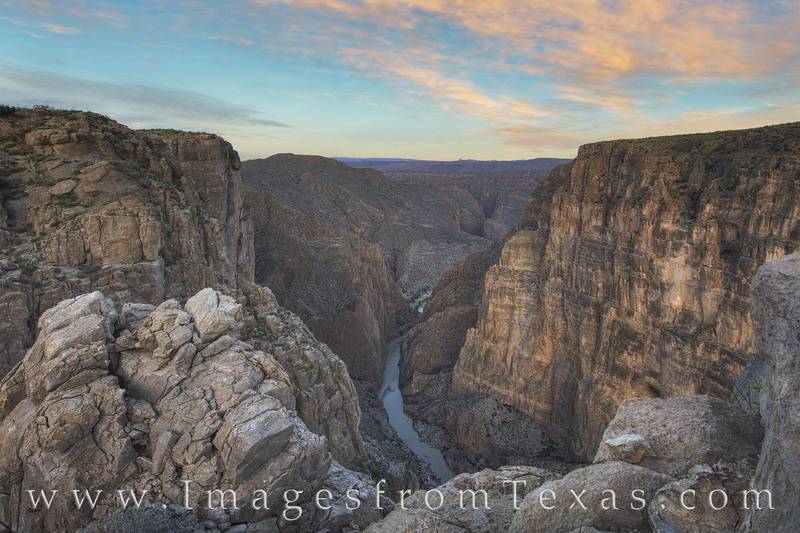 It took 5 hours to arrive at this amazing overlook deep a remote region of Big Bend National Park – a 2+ hour drive across to pretty rough roads and a 3.5 mile hike across a foresaken desert finally brought us to this point – the stunning Marascal Canyon. 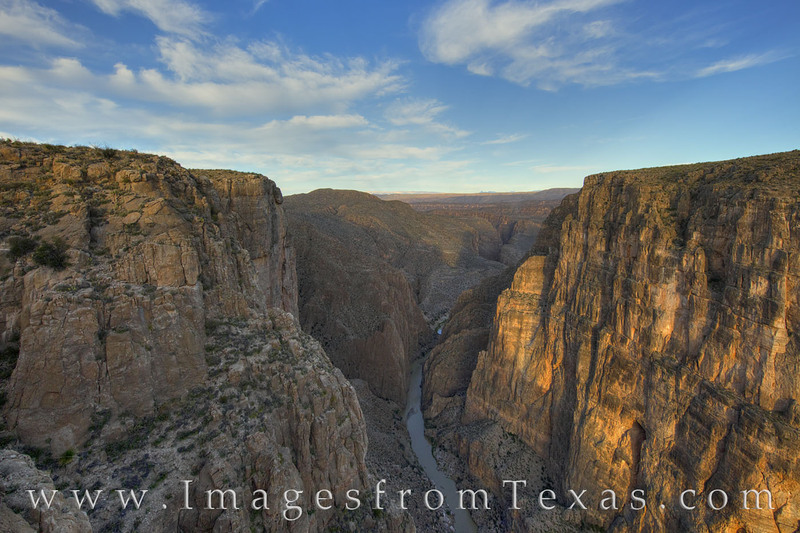 Below, the Rio Grande cuts through the 1200 foot canyon as it meanders east, dividing Texas and Mexico. Views and lanscapes like this – with not a single person within 2 hours – are what keep me coming back to this national park, both for photography and for escape. After spending some time on the rim of Mariscal Canyon, we started the trek back to the jeep. The sky over Mariscal Canyon was already fading, but as we walked east, the setting sun provide one last explosion of light. 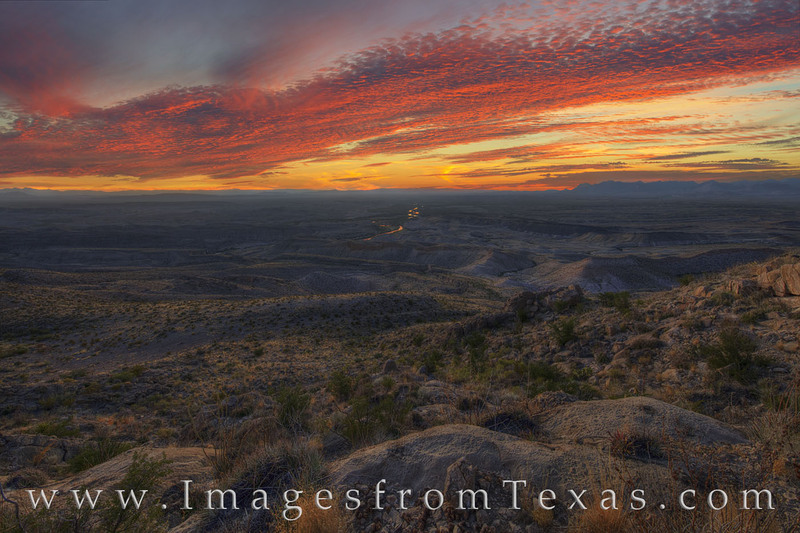 In the distance, you can even see the orange light reflected in the winding Rio Grande as it divides Texas and Mexico. Using a powerful flashlight and headlamps, we methodically followed the cairns, picking our way through dark terrain. At one point, we even surprised a family of Javilinas which was a little unnerving. Nearly two hours later we arrived back at the Jeep. Next came that horrid road, then paved road back to Terlingua to drop off the Jeep, pick up my car, then drive back to the Lodge… all in all more than 3 hours of driving before arriving at our room just before midnight. Glorious morning light greeted me on this final day of a November excursion to Big Bend National Park. In the foreground, a golden Ocotillo in the Chihuahuan Desert stood still in the cool Autum air and overhead the sky exploded in an array of orange, red, and blue. If you are ever at Big Bend and have the desire to see one of the most amazing and remote parts of Texas, I highly recommend Mariscal Canyon. Otherwise, I hope you can enjoy the images I captured that memorable evening in early November. Posted in Big Bend National Park, Texas Landscape Images on November 21, 2017 November 21, 2017 by Rob Greebon. ← Previous: "My Happy Place"
Absolutely beautiful images Rob! I’ve been thinking of Big Bend so much lately. This weather seems the best time to be there, wish I was there today. I’m enjoying your photos immensely. Thank you for sharing them.